english name "Pink-Gilled Destroying Angel"
intro The following is based on the original description of Coker (1917), with the addition of my observations of the type. RET would like to make it clear at the outset that this species is very difficult to separate from A. elliptosperma. The possibility of synonymy is very real. cap The cap is 45 - 60 mm wide, plano-convex with slight umbo, smooth, wet-looking, viscid, generally white, shading to straw or pinkish-straw color over center, with a nonstriate margin. The flesh is nearly white, 2 mm thick over the stem, unchanging when bruised. gills The gills are barely reaching the stem, moderately close, rounded at the stem, 4 - 4.5 mm wide, white at first, discoloring to pinkish-buff or pink. stem The stem is up to 80 × 5 - 6 mm (length includes bulb), tapering upward, white, with a ellipsoid to elongate-ellipsoid bulb. The center of stem is slightly stuffed but not hollow except by insect larvae. The volva is limbate; the free limb is 5 - 10 mm long, collapsing on stem. The ring is fragile and easily reduced to shreds. odor/taste The mushroom is odorless and tasteless. As a precaution, this mushroom should be assumed to be deadly POISONOUS. spores The spores (as reported by Coker) measure 10 - 11.5 × 6.6 - 7.8 µm and are amyloid. Spores from the photographed collection measured (8.4-) 9.0 - 10.5 (-11.5) × (5.9-) 6.3 - 7.8 (-8.5) µm and were broadly ellipsoid to ellipsoid and amyloid. Clamps are probably absent from bases of basidia. discussion This is one of the taxa that is extremely close to Amanita elliptosperma G. F. Atk. and the name of which could well be placed in synonymy with the name of the latter. See the discussion of A. elliptosperma in the key to species of sect. Phalloideae in Central and North America. The photographed collection was not reactive to application of KOH solution. Originally described from North Carolina, USA, under oak (Quercus) with small Canadian hemlock (Tsuga canadensis) nearby. Coker notes that this species is more brittle or fragile than other species to which the name "destroying angel" is applied on this site. He also pointed out the "flesh-colored" gills as a distinctive character and mentions that the stem is rapidly hollowed by "grubs." Coker's photographs depict specimens which are at least fragile or over-mature. 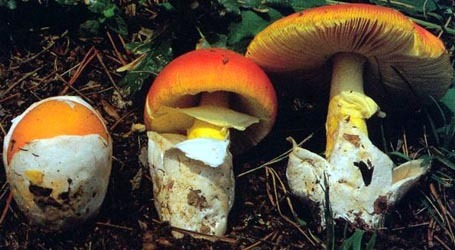 Many species of Amanita will be distinctly water-soaked if collected shortly after rains or when the substrate is very (unusually) wet for other reasons. Under such conditions, it is common to find a water soaked line at the connection of the gills to the cap flesh. 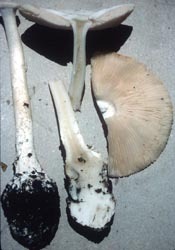 The stuffing of the stipe is another part of Amanita fruiting bodies that commonly becomes water soaked when plentiful moisture is present. author Coker. 1917. J. Elisha Mitchell Scient. Soc. 33(1/2): 33, pl. 17-18, 64.
pileus from protolog: 45 - 60 mm wide, rounded to gibbous to nearly planar, pallid white with the disk shading to straw-colored or pinkish straw-colored, smooth, wet-looking, viscid; context to 2 mm thick at stipe, nearly white, unchanging when bruised, brittle, fragile; margin with delicate striation, nonappendiculate; universal veil absent. lamellae from protolog: rounded at stipe and barely adnate, moderately close, white then discoloring to pinkish buff or skin-tone of persons of European ancestry, 4 - 4.5 mm broad; lamellulae not described. stipe from protolog: to 80 × 5 - 6 mm (length includes bulb), tapering upward, nearly smooth, white or with a few stains of brown below; context brittle, fragile, with lightly stuffed central cylinder only hollowed by action of larvae; bulb rather large; partial veil white, thin, delicate, almost always torn and hanging collapsed and fragmented, with point of attachment about 15 - 20 mm below apex; universal veil adnate with free limb about 5 - 10 mm long which collapses on the stipe. odor/taste from protolog: Odor and taste both lacking. basidiospores from protolog: 10 - 11.5 × 6.6 - 7.8 μm, (est. Q = 1.43 - 1.51; est. Q = 1.47), smooth, ellipsoid, adaxially flattened (per figure); apiculus sublateral (per figure); contents monoguttulate (per figure); white in deposit. ecology from protolog: Under small Tsuga canadensis in manured lawn. material examined from protolog: U.S.A.: NORTH CAROLINA—Orange Co. - Chapel Hill, University of North Carolina, "The Rocks," former home of W. C. Coker, 26.vi.1916 W. C. Coker 2261 (holotype, UNC), 28.vi.1916 W. C. Coker 2275 (paratype, UNC). photo RET - (1-2) Amanita hygroscopica Coker, West Virginia, U.S.A.
select a collection to review/add spore measurements..#783710. W. C. Coker, #2261, U.S.A., NORTH CAROLINA, Orange Co., Chapel Hill, Un..#783711. W. C. Coker, #2275, U.S.A., NORTH CAROLINA, Orange Co., Chapel Hill, Un..